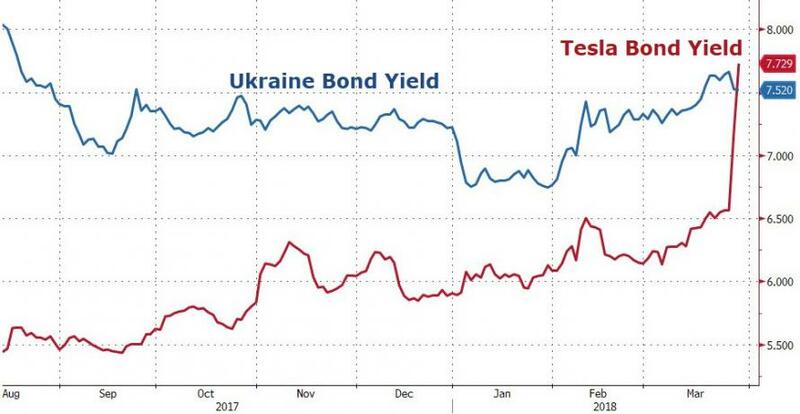 Update: How the hell is Musk gonna raise capital in any way efficiently when corporate bond yields are higher than those of Ukraine? 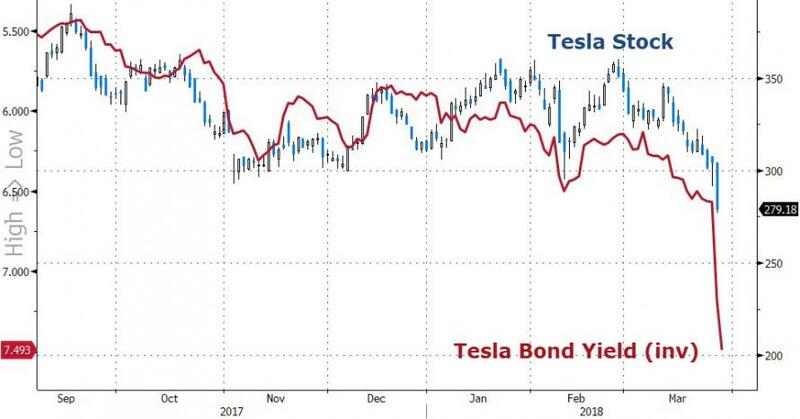 As we detailed earlier, a fatal crash earlier this month that left a Tesla Model X smouldering on the shoulder of the southbound lane of Highway 101 in Mountain View has hammered Tesla shares to their lowest level in a year while pushing the yield on its debt above 7% (though an ill-timed Moody's downgrade also had something to do with that). Once again, Tesla finds itself in the crosshairs of the National Transportation Safety Board. It's last brush with the federal regulator ended without incident - the agency ruled that a fatal Florida crash was the result of driver error, and that Tesla's controversial autopilot software (which has been implicated in several fatal accidents) was not at fault. 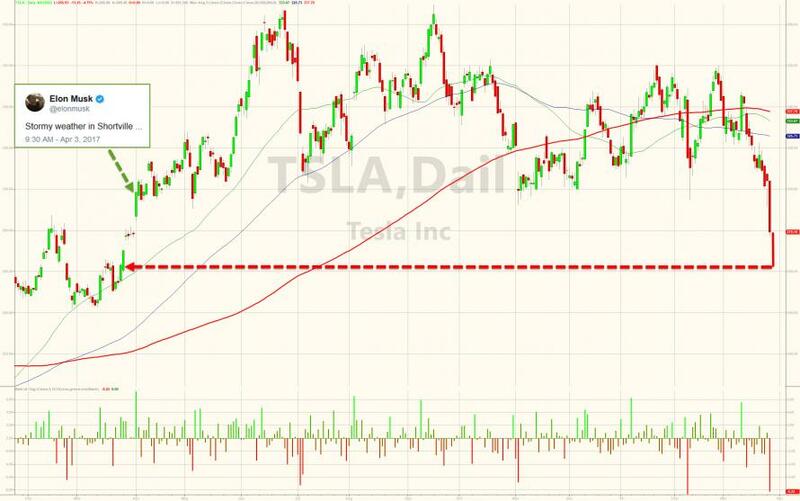 But as two teams from the NTSB sift through the evidence gathered from the fiery crash site, Tesla said in a blog post published Tuesday night that it hasn't been able to analyze any of the data collected from the scene - and therefore doesn't yet know what caused the crash - because the car was so badly damaged, as Bloomberg pointed out. The company hasn’t been able to retrieve the vehicle’s logs and is working with authorities to access them. Tesla hasn't disclosed whether the driver had engaged Tesla’s partially autonomous driving system, known as Autopilot, when the crash occurred. Interest in the effectiveness of self-driving technologies is elevated thanks to a deadly Uber Technologies Inc. accident that happened days earlier involving an autonomous car and a woman who was crossing the street with her bicycle. That accident is believed to be the first fatality involving an autonomous vehicle. Tesla owners have driven the same highway stretch with Autopilot engaged about 85,000 times since the system was introduced, and no accidents have been reported that the company is aware of, the carmaker said. The NTSB is investigating whether autopilot was involved in the crash and is also looking into techniques for safely removing smouldering battery components from electric vehicles. 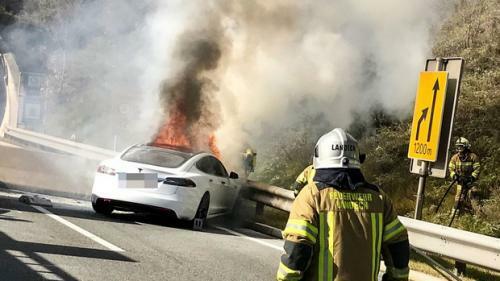 Tesla said its battery packs are designed so that when a fire occurs, it spreads slowly so people have more time to exit the car. "That appears to be what happened here as we understand there were no occupants still in the Model X by the time the fire could have presented a risk," Tesla said. The post also showed photos of the concrete divider that the Model X hit. In days prior to the crash, a long metal barrier that extended out of the concrete divider, a barrier meant to absorb the impact of a crash before a driver hit concrete, had been present - but was removed some time before the fatal crash. 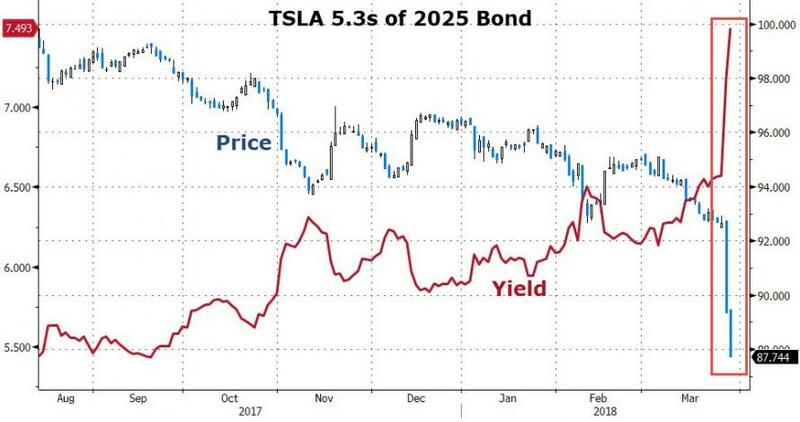 John Thompson of Vistas Capital Management told MarketWatch that, unless Elon Musk "pulls a rabbit out of his hat" the company could be bankrupt within four months. Thompson sense the core of the problem for Musk. That his company's lofty share price has been built almost entirely on marketing - "the narrative", as Thompson describes it. But there's only so much failure shareholders can countenance before even the gullible start asking questions. "Companies eventually have to make a profit, and I don’t ever see that happening here. ""This is one of the worst income statements I’ve ever seen and between the story and the financials, the financials will win out in this case." Meanwhile, Musk is up to his usual tricks - promising to delete Tesla's and SpaceX's Facebook pages in a reply to a random user, allowing him to deflect attention from Tesla's troubles while simultaneously taking a shot at one of his chief rivals. Stormy weather in Muskville once again.